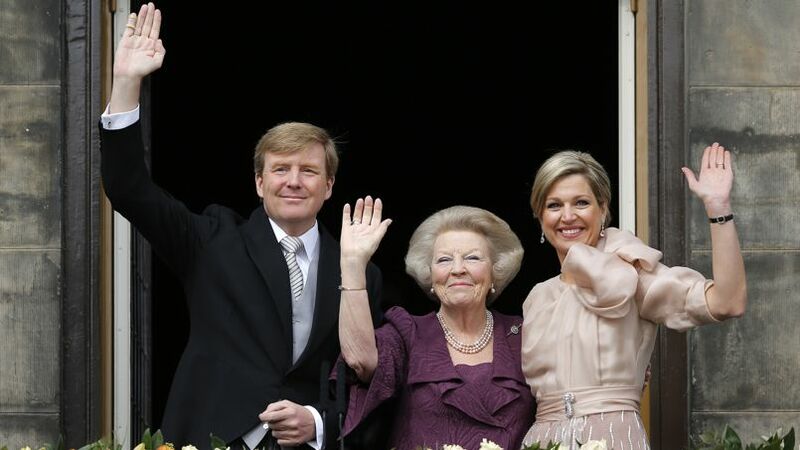 radical royalist: A new Monarch for the Netherlands - Leve de Koning! 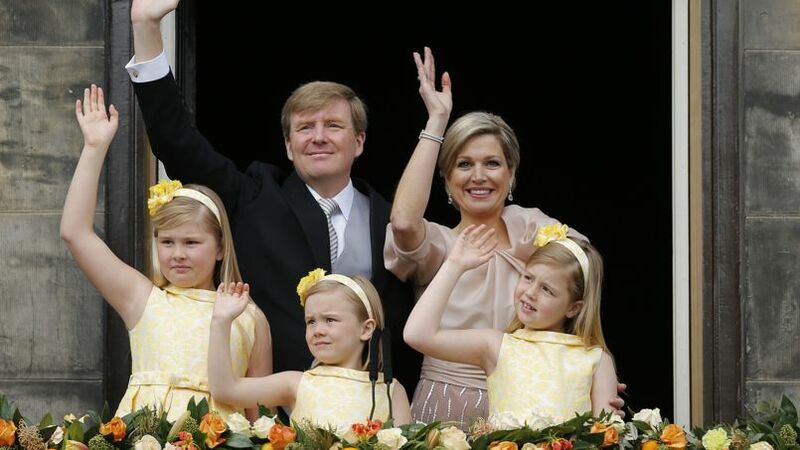 A new Monarch for the Netherlands - Leve de Koning! 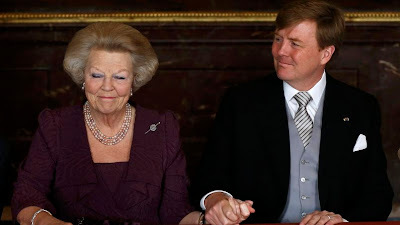 Crown Prince Willem-Alexander became Europe's youngest monarch today after his mother, Queen Beatrix, renounced to her rights as Queen of the Netherlands. 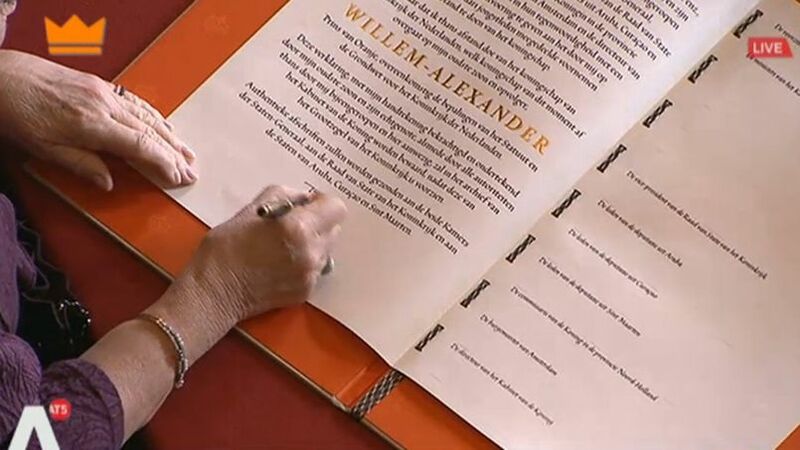 At 10.10 am Queen Beatrix signed the document making her son King Willem-Alexander. "I, Queen Beatrix, abdicate in favour of my son Willem-Alexander," the act said, as read out before the signing by the director of the royal cabinet that was broadcast live from the Amsterdam palace to the Netherlands and the world. In Melbourne the Dutch community watched a programme broadcast by bvn. Queen Beatrix signing the document. King Willem-Alexander, Queen Máxima and their three daughters, Catharina-Amalia (9), the new Princess of Orange, Alexia (7) and Ariane (5) on the balcony together for the first time as the new royal family. 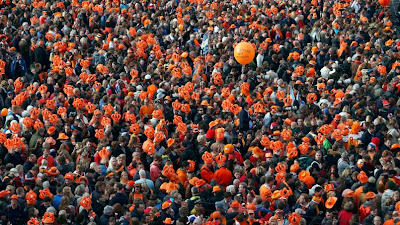 An orange sea welcomed the new King of the Netherlands. Today I stand before this joint session of Parliament to be sworn in and invested as your new King. You have gathered here in the nation's capital for this purpose as the elected representatives of the people. This symbolises our constitutional bonds. Over the course of two centuries, the Dutch monarchy has become inextricably linked with our parliamentary democracy. This investiture and the oath I am about to take confirm this connection, which is enshrined in the Charter for the Kingdom and the Constitution. Democracy is based on mutual trust. The people's trust in the government - one that respects the law and offers its citizens prospects for the future. But also the government's trust in the people - citizens who feel a shared responsibility for the public interest and are willing to stand up for one another. All holders of public office, whether they are elected, appointed or designated, must contribute to that trust. That is how democracy is maintained. In her final Christmas address as Queen, my mother said, 'Achieving mutual trust is an ongoing challenge, both in the big things and the small.' For 33 years, she gave her trust, and repaid the trust placed in her. This provided the basis for her authority. She stood for the values enshrined in the Constitution. Values to which she swore to remain faithful on 30 April 1980. Values to which she gave expression whenever she felt it necessary. After all, the fact that the monarch has no political responsibility does not mean that he or she bears no responsibility at all. That would render meaningless the oath I am about to take in this joint session of the States General. As Queen you were fully conscious of the responsibilities attached to your position. You were utterly dedicated to the duties of your office. But you were also a daughter, a wife, a mother and head of the family. And you have always sought to do full justice to each of those responsibilities. Sometimes you felt torn, but you combined your many duties with great inspiration. You never refused a request for help. Even in times of personal sorrow you supported us all in the most loving and dependable manner. With the help of my father, you developed your own style as Queen. You never chose the easy path of fleeting popularity. You navigated stormy waters, charting a sure and steady course in the knowledge that you were part of a long tradition. Now, I follow in your footsteps. And I have a clear picture of my duties. No one knows what the future may hold. But wherever my path leads, and however long it may be, I will always carry with me your warmth and your wisdom. I know that I speak for many in the Netherlands and in the Caribbean parts of our Kingdom when I say: thank you for all the wonderful years in which you served as our Queen. Each monarch fulfils his duties in his own fashion. He is a different person from his predecessor, and he is of a different time. The monarchy is not a static institution. Within the bounds of our constitutional rules it has always managed to adapt to changing circumstances. The States General and the ministers have always given the monarch the necessary scope. At the same time, the monarchy is a symbol of continuity and unity. It is a direct link with our constitutional past. It is a historical tapestry, which together we are still weaving today. The basis for the values we share can be found in our history. One of those values is the monarch's role as servant of the people. The King performs the duties of his office in the service of the community. This deeply rooted principle was laid down by the States General as early as 1581, in the Act of Abjuration, the birth certificate of what would eventually become the Netherlands. I succeed to the throne at a time when many in the Kingdom feel vulnerable and uncertain. Vulnerable in their jobs or their health. Uncertain about their income or the environment in which they live. It now seems less self-evident that the next generation will be better off than the last. As individuals, we seem to have little influence over the events that shape our lives. Therefore our power lies not in isolating ourselves but in working together. As families and as friends. As residents of a street or neighbourhood. As citizens of our Kingdom. And as inhabitants of an Earth confronted with countless challenges that can only be met by working together at international level. Unityanddiversity. Individualityandadaptability. An appreciation of traditionanda healthy curiosity about what the future will bring: these are the qualities which over the centuries have made us who we are today. Our need to explore frontiers and set new boundaries has taken us a long way. We have five remarkable Dutch individuals here who are symbols of that. Today they fulfil a traditional role,* but they are also living proof of what we are capable of achieving. Behind them stand hundreds of thousands of others who have each distinguished themselves in their own way. Their efforts are invaluable, too. The hope of our country rests in the combined power of all these people with all their talents, big and small. For centuries, our greatest strengths have been our inventiveness, our diligence and our openness. With such qualities, we have a great deal to offer the world. As King, I want to encourage people to make active use of their opportunities. However great our diversity, however different our beliefs or dreams, and however varied our backgrounds, in the Kingdom of the Netherlands everyone can have a voice and can contribute to society on an equal footing. I will take pride in representing the Kingdom, and in helping to uncover new opportunities. I want to establish ties, make connections and exemplify what unites us, the Dutch people, and not only in times of great joy or deep sorrow. Thus, as King, I can strengthen the bond of mutual trust between the people and their government, maintain our democracy and serve the public interest. I accept this office with gratitude. I am grateful for the upbringing my parents gave me, and for the freedom I have been given to prepare for this role. Many people have helped show me the way, both in their words and in their deeds, and I would like to thank them all. Successive governments, with the support of the States General, have given me the opportunity to play a role in various fields and so to undertake many activities both in and on behalf of the Netherlands. This work has given me a sense of what I can contribute in my position. It has also allowed me to gain a deep insight into issues, such as responsible water management, which are fundamental to our country. My experiences at home and abroad have made me the person I am. I can say with confidence, both to myself and to the world: I accept this office with full conviction. And in doing so, I acknowledge how deeply happy I am to have the support of my wife, Máxima. She is conscious of the personal constraints her position sometimes entails. She has embraced our country and become a Dutchwoman among the Dutch people. She stands ready to apply the full range of her abilities in the service of my reign and the Kingdom at large. Today, we stand before one another to affirm our mutual responsibilities and obligations. The Charter for the Kingdom and the Constitution are our common foundation. Through good times and bad, let us build on that foundation in the full confidence that together we can face the future with our heads held high. With that conviction, I aim to fulfil my duties as King with all the strength I am granted. I swear to the peoples of the Kingdom that I shall constantly preserve and uphold the Charter for the Kingdom and the Constitution. I swear that I shall defend and preserve the independence and the territory of the Kingdom to the best of My ability; that I shall protect the freedoms and rights of all its citizens and residents, and shall employ all means placed at My disposal by the law to support and promote the Kingdom's welfare, as is incumbent upon a good and faithful King. "I dedicate undying faith to this land of mine"
Since that time, the unconditional loyalty of the founding father of our country has also been demonstrated by all those who have fought for our freedom. To this day, this loyalty forms the bedrock of our country's history, which is closely connected with the House of Orange. From 1890 onwards, our national unity was inextricably linked with four female heads of state. After Queen Regent Emma, after my grandmother Wilhelmina - so valiant in wartime - and after my mother Juliana, with her strong sense of duty, the task and privilege of being your Queen fell to me. The unifying power shown by previous generations was my inspiration. In our constitutional monarchy, with the Constitution as our foundation, the monarch stands for unity in the service of a constantly changing society. 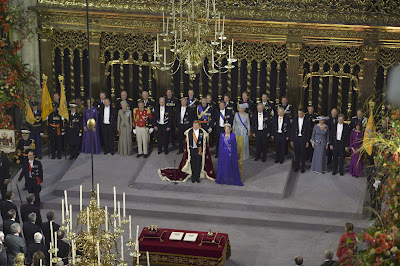 At the investiture, in the presence of the States General, the monarch swears to uphold the Constitution and protect the rights and freedoms of all the inhabitants of the Kingdom. The converse of ministerial responsibility for the acts of the monarch is the duty of the monarch - within the government - to coordinate his actions with the ministers. Democratically enacted laws and decrees are ratified by the monarch's signature. In day-to-day life, the monarch can contribute to respect for democracy, to solidarity within society and to integration and personal development for all sections of the population. This calls for full and unconditional dedication to what - sooner or later, to a greater or lesser degree - presents itself as the common interest of our society. Neither power, nor personal will, nor a claim to inherited authority, but solely the determination to serve the community can give substance to today's monarchy. In fulfilling this task, the monarchy aims to foster a community whose members feel solidarity with one another. Throughout the last thirty-three years I have had the privilege of meeting great numbers of my compatriots who put themselves at the service of other people, demonstrate their commitment and are willing to do their utmost for their country. I have seen what creative effort and perseverance can accomplish, in the most diverse circumstances. Over the years, my appreciation of people's impressive achievements in science, art and culture has grown immensely. Scope for self-expression and exploration of new avenues are of vital importance for us all. The way people of different beliefs or convictions seek to draw closer to one other has touched me deeply, also because it is a sign of openness and tolerance. In all this, the great trust you placed in me was indispensable. I have shared both joy and national pride with you. And I have shared in your sorrow and anxiety. The population of the Netherlands in Europe and in the Caribbean parts of the Kingdom have strengthened me with their spontaneous warmth and expressions of solidarity. Beyond our borders too, international contacts proved their worth in furthering mutual understanding. The vicissitudes of the world touch our daily lives. Countless ties bind us to people in other continents. This compels us to remain open to other ways of life and other cultures. A divided Europe long bore the scars of a past marked by war and violence. Today, peaceful cooperation and an awareness of common interests prevail. Decisions made by the European Union determine our daily life where this is necessary or useful. Our own self-interest obliges us to contribute to the common interest and to the wider perspective of a shared responsibility in the world. In all this, I had the great good fortune to be able to count on the support of Prince Claus. His level-headed insights and nuanced approach were of great value to me. Through his work in the fields of urban planning, the environment, development cooperation and culture, he focused attention on crucial social issues. He taught our sons, when they were still very young, to be alert to developments in society and to suffering and need in the world. In this way, he brought our House closer to modern times. History may indeed conclude that my choice of husband was the best decision I ever made. Since I announced my intention to relinquish the throne, I have been overwhelmed by expressions of warmth and kindness, accompanied by a profound understanding of my wish to hand over my task to the Prince of Orange. He is well prepared for every aspect of his new role, through his intensive activities at national and international level and his keen interest in the developments taking place in our world today. 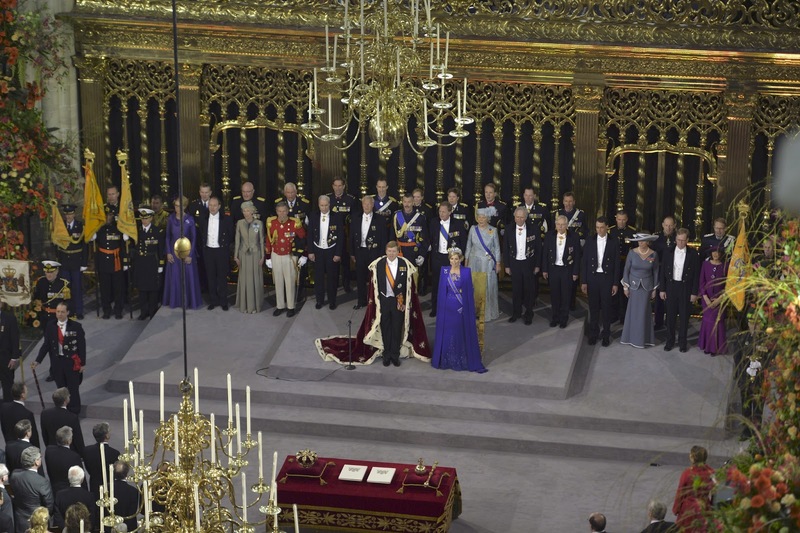 During the ceremonial investiture in the Nieuwe Kerk in Amsterdam, King Willem-Alexander will accept the imperative that is essential to the office: to act without regard to personal preference, and to stand above the interest of party or group. 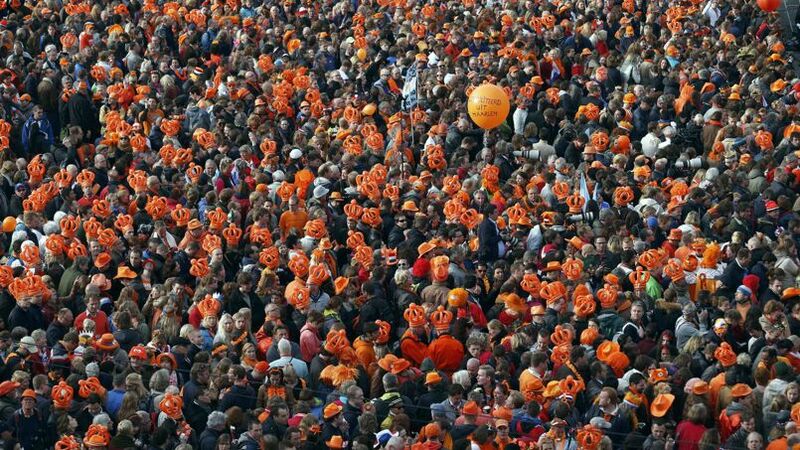 In fulfilling his task, he will ask for the support and trust of the Dutch people. We all feel blessed by the fact that his endearing wife Máxima, with her warm heart and clear understanding of human relations, will play a special role. In laying down my duties as Queen, I am above all filled with a sense of deep gratitude. Without your heart-warming and encouraging expressions of regard, the burdens of office - and they have certainly made themselves felt - would have been very heavy indeed. I would like to let you know, in saying farewell, that your affection has given me the strength I needed. In the future too, your continuing closeness will remain a great support. When tomorrow my eldest son assumes this rewarding and responsible task, it is my dearest wish that the new Royal couple will also feel supported by your loving trust. I am convinced that Willem-Alexander will devote himself, with loyalty and dedication, to discharging his duties as a good King should. The following members of the Royal Family, Royal Delegations and Special Delegations were present at the ceremonies surrounding the abdication and investiture on 30th April. I wonder, why doesn't He choose William IV as his Regnal Name? In a televised interview Willem-Alexander said he did not want to be a number. ‘Willem 4 is in a field, next to Bertha 38,' he said, referring to the way cows are named and registered.